Steward is a village in Lee County, Illinois, United States. The population was 256 at the 2010 census. Steward, Illinois, was named for Wesley Steward, who in 1855 came to this area in Alto Township to settle the land owned by his father, Marcus Steward. John Grimes built the first house in Alto Township in Plum Thicket in 1847, located east on the outskirts of the village as it is today. In 1861, Mr. 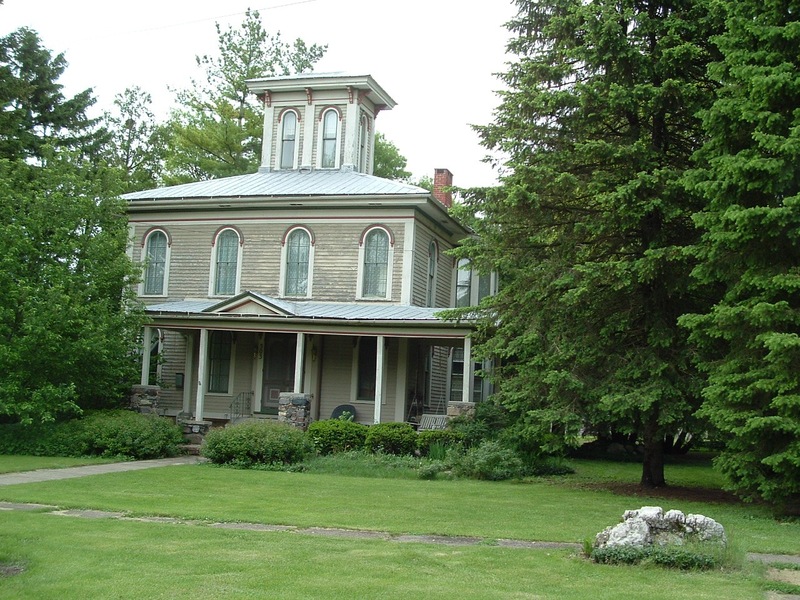 Steward married and built the first farm house in the location of Steward, which is still standing. The town is located in the west central part of Alto Township and the northeast part of Lee County. Mr. Steward was influential in getting the Chicago and Iowa Railroad, now known as the Burlington Northern, through the township extending from Hinckley, Illinois to Rochelle, Illinois completed in 1870. The Village Hall on Main Street is one of the oldest buildings in existence and the jail cells bought in 1903 and housed in the building are still one of the few reminders of the early days (not used). In 1872 Mr. Steward built the first elevator at the east end of Main Street run by steam. The history of the elevators in Steward over the years is a story in itself. 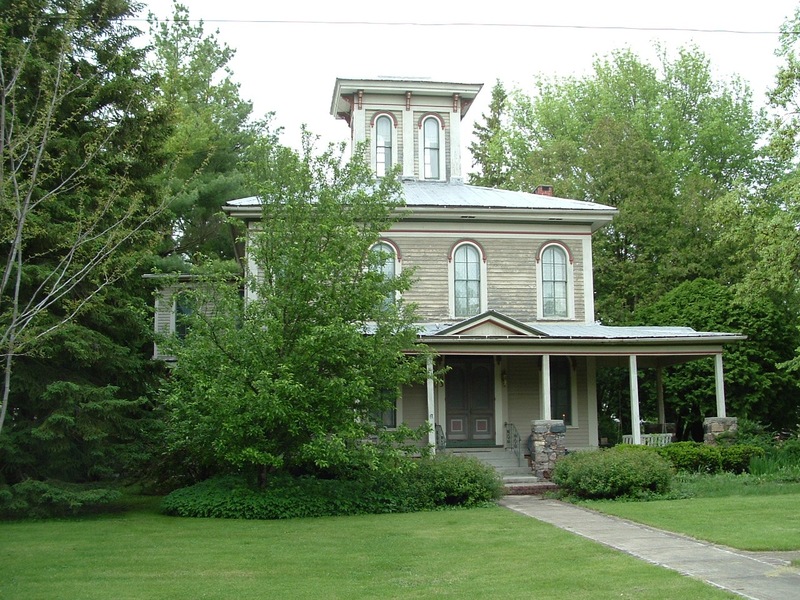 The first house in Steward after the town’s formation is on John Street, also standing today, built in 1872. The railroad offices and warehouse were in Wesley Steward’s barn until 1871, when the first depot was then built. It is said to have burned down in 1894. The present depot, no longer in use by the Burlington Northern and in the process of being salvaged by a group in interested citizens of the village as a historical landmark, a museum, library, and social meeting place for anyone in the community, was built in 1896. This project “The Steward Illinois Depot Project, Inc.” was being projected as a Bicentennial venture during the 1976 year. In 1902 Steward was selected as the junctional point for the Chicago, Milwaukee and St. Paul Railroad Company as they recognized the need for a railroad to run south out of Rockford, Illinois. The Milwaukee depot and switch tower for both railroads were on the northwest edge of town. 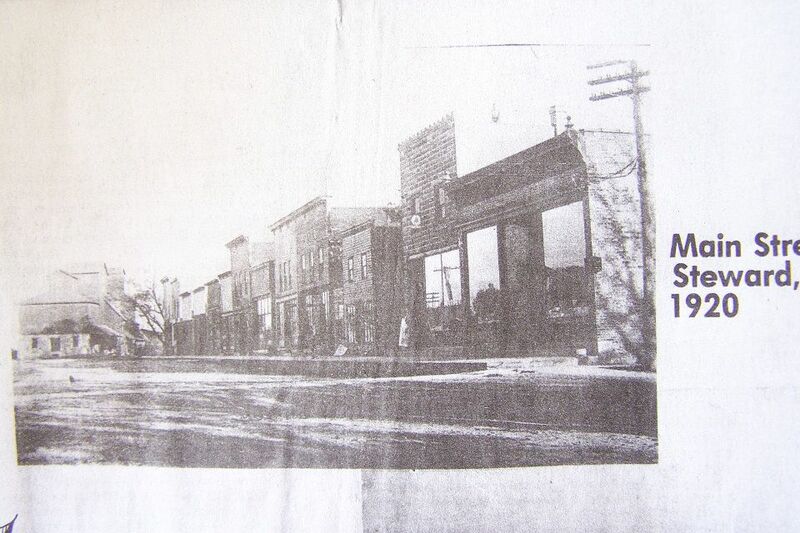 The first businesses were a restaurant and general merchandise store built in 1871. By the early 1900s, business houses were located on both sides of Main Street with a steady growth and expansion until the depression days when the town could then gradually see a decline in the businesses. The charter for the First National Bank of Steward was signed and issued on December 18, 1902. A new building was erected and business started January 2, 1903 and continued till 1933. The first Post Office was established at Heaton Aug. 31, 1871 and located in the Steward depot. It was relocated in Steward April 12, 1876. Today it is located in the old bank building on Main Street. By 1976, the village became mostly a residential community with the exception of the Post Office. Famous people: Leroy George Herrmann (Born: February 26, 1906 in Steward, Illinois – Died: July 3, 1972 in Livermore, California), was a professional baseball player who played pitcher in the Major Leagues between 1932 and 1935 ; he played for the Chicago Cubs and Cincinnati Reds.